The rotator cuff is one of those areas that is so frequently injured or dysfunctional that most people will have heard the term “rotator cuff”, even if they have no clue what it refers to. This blog series will help us get familiar with this part of the body, have us practicing some impressive Latin, and will show us ways to increase the stability and strength of the rotator cuff muscles and the shoulder girdle in general. This muscle originates in the hollow of the supraspinatus fossa of the scapula, runs underneath the bony acromion, and attaches to greater tubercle of the humerus. It functions to take the arm out the side. This larger muscle originates under the spine of the scapula, below the supraspinatus, tucks under the deltoid and inserts onto the greater tubercle of the humerus. Just behind the insertion point of the supraspinatus. This muscle functions in externally rotating the arm. This thin muscle begins on the lateral edge of the scapula and hooks into the greater trochanter, just behind the insertion of the insfraspinatus. The function of the teres minor is also to externally rotate the shoulder. This broad muscle is unlike the other three in that is sits on the anterior surface of the shoulder blade, between the scapula and the ribs. 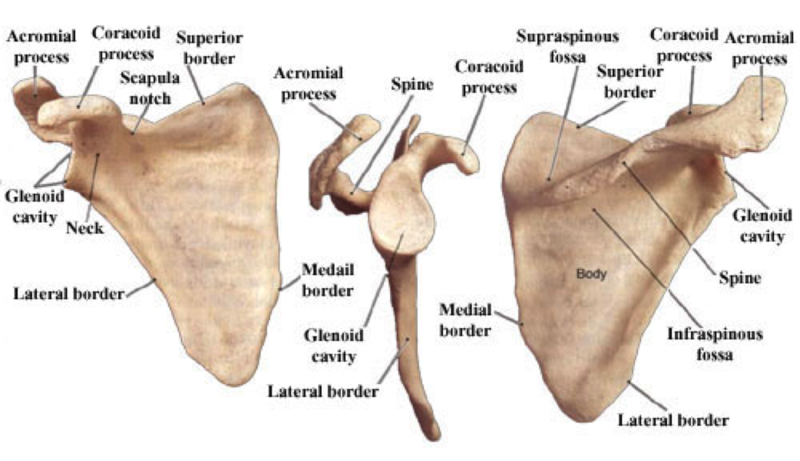 It covers the entire triangular surface of the scapula, then its broad tendon inserts onto the lesser tubercle of the humerus, at the front of the shoulder. This muscle functions to internally rotate the shoulder, the only one of the RTC muscles to do so. Keeping the head of the humerus centered in the glenoid fossa while the arm is in motion. Since the shoulder joint is a shallow ball and socket joint, it thus has significant freedom of movement; both of these factors make the shoulder joint relatively unstable. The rotator cuff muscles help to maintain critical shoulder stability. Counteracting the upward vertical pull of the deltoid muscles, the RTC muscles depress the head of the humerus in various shoulder elevation movements. The inverse is also true; when a client has a dysfunctional rotator cuff, they present with tight deltoids and often with pain at the deltoid insertion midway down the humerus. Helping the humerus stay in external rotation while the arm is moving into abduction. This is important so that the humerus does not bump up against the body acromion, which would limit the abduction of the shoulder joint. When the rotator cuff muscles do not perform this function well, shoulder impingment can occur. As we can see, these functions clarify the role of the rotator cuff muscles to fine-tune the position of the humerus. This fine-tuning is so important because, unlike most joints in the body, which have a single axis around which they rotate (think of the knee or the elbow, which primarily move as hinges), the shoulder has no fixed axis. Because of this, any movement of the upper arm creates a series of unique rotational forces and these require precise coordination of both the timing and contraction of shoulder muscles. In clients with rotator cuff tears or dysfunction, the RTC muscles activate later and less powerfully than the muscles of the neck and chest. This condition is caused by irritation and inflammation one or more RTC tendons, where they attach to the humerus. It is usually a condition with a sudden onset, such as recent overuse. It is common in athletes that engage in throwing or pitching sports. It is also common in those that do repetitive shoulder movements or heavy lifting. In this condition, the rotator cuff tendon becomes trapped in the space underneath the bony acromion. As the tendon gets repeatedly trapped with overhead movements, this can lead to fraying of the tendon. Impingement may occur due to longstanding wear and tear, but also due to bony changes in the acromion that often occur with older age or arthritic conditions. This refers to a tear in any one of the four rotator cuff tendons. In young people, tearing most commonly occurs as a result of trauma, falls, or other injuries. In the older population, tears are more likely due to impingment syndrome and the resulting fraying of the tendons. Signs of Weakness or Dysfunction in the Rotator Cuff. Difficulty with shoulder flexion, abduction, external rotation and internal rotation, however it is most common to have weakness with external rotation and abduction. To properly diagnose a potential rotator cuff injury, please refer your client to a registered physiotherapist. If you already know that your client has weakness or dysfunction with the rotator cuff, stay tuned for next week’s installment. We will look at the best exercises to strengthen the rotator cuff muscles. Was this article helpful for you? Do you have any further questions? If so, please leave them in the comments section below. Yes, I found this article helpful. We’re glad you enjoyed the article, Bev! And thanks, we’ve made that update. Thank you, very helpful info. Am looking forward to the exercise suggestions! So nice to hear your enjoyed this article. Stay tuned for more anatomy-based articles coming up!